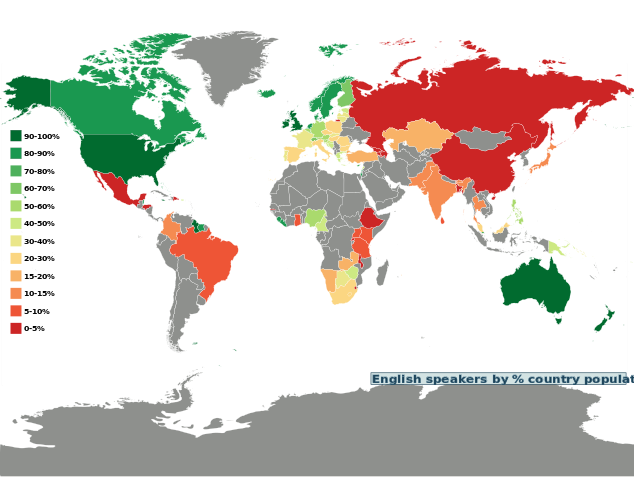 The majority of the world's population does not speak English, but it is still seen as the global language. Education systems that focus on one language as the medium of instruction bring up questions of educational equity. Most countries use English as the primary medium of education, raising questions of who has access to this “global” education and who does not. Many people, especially in developing countries, view learning English as the path to success, and a way to compete in the global economy. People also tend to equate language with intelligence, implying that people who do not have the opportunity to learn English are not as “intelligent” as people who can speak the language fluently. This is why many people advocate for English as the primary language of instruction. In my field experiences in rural Sindh, some respondents believed that the education they received at their local schools was not worth much because they were only taught Sindhi and Urdu. They said they would rather learn English. Some students had even stopped going to school for this reason. Once, a field researcher I was working with let slip that I could speak English well. The women around us instantly started clamoring for me to say something to them in English. They could not understand it, but the fact that it was English - the language of the educated and wealthy - had them enthralled. The seemingly global obsession with English has costs. English is becoming more popular, and a language dies every 14 days. The two may be connected. When a language dies, we lose more than just another method of communication. Languages hold traditions and memories and allow for different kinds of thinking. Research has shown that using English as the language of instruction (where it is not the mother tongue) has a negative impact on students’ academic achievement. Amongst others, one reason for this – and this is more often true for low-income and public schools - is that teachers themselves are not proficient in English and do not have adequate training or resources to teach the language. In Pakistan, there are so many languages and dialects spoken that even Urdu is a second or a third language for many children. Learning other subjects in a language you do not understand is a lot more difficult as well. This means that, rather than acting as an equalizer, English education in Pakistan reinforces the division of society. With all the barriers it presents, should English be taught at all? It wasn’t always necessary for everyone to speak the same language to share knowledge and ideas. There have been times when information was accessible to people from many different regions through translation. With such a system where knowledge is easily translated and accessible, it might not be necessary to be skilled in English to be seen as worthy in academia. Proponents of teaching primarily in English point out that, in a world that is becoming increasingly smaller, it is necessary to have a common global language to make communication easier. It is inevitable that countries will switch from speaking just their native languages to speaking English as well (or instead of their native language). The question then, is how can a native language be preserved along with the introduction of English? Is it possible for students to be proficient in both languages, as well as other native languages that they may speak at home, or will this process result in the inevitable dying out of many more languages? In addition, is it possible for English to be consistently taught proficiently, providing all children with equal opportunities, so that it does not reinforce the cycle of poverty? There are many factors to consider when thinking about whether English- or any language- has a place in global education. It could be seen as potentially very harmful in reinforcing silence, and acting as a barrier to education. On the other hand, it is important to have a common language to communicate. The overarching question then is, where do we draw the line? There were over 250 languages in Australia before first European contact, of which less than 20 remain to be the languages for daily use. Even these few languages have no future as the government prefers communication in English, leaving little incentive for learning the languages of shrinking aboriginal communities. A complete reliance on English does have the tendency to kill the languages with few speakers and all the traditions that they carry.